View Large Image Not in alphabetical order! New selection just arrived! 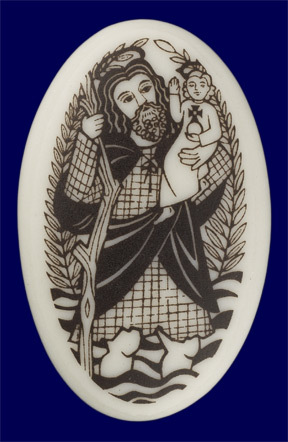 Check out our current listing of Saints and Prayers! 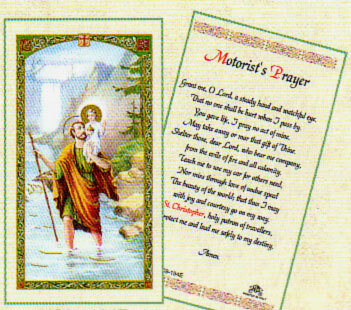 LAMINATED HOLY CARDS - lovely cards with pictures of your favorite saints and scenes and prayers on the back. These are the beautiful images you?ll remember from your childhood, (not the "modern" holy card images)...Super online price- .65 each! 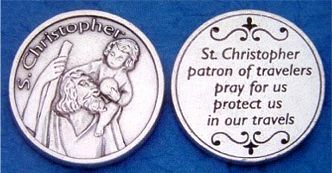 - Many motifs including St. Christopher ABOUT ST. CHRISTOPHER: St. Christopher is a Third century martyr in the persecutions of Decius. Little else is known for sure. His fame derives from the pious legend of him being a Christ-bearer (Christopher). He was a powerfully built man who wandered the world in search of novelty and adventure. He came upon a hermit who lived beside a dangerous stream and served others by guiding them to safe places to cross. He gave Offero instruction in the truth of God. Offero took his place, but instead of guiding travellers, he carried them safely across the stream.